Did you know that I have a page on BookBub? The site is a fabulous way to keep track of ALL your favorite authors. Just click “follow” and you’ll be notified when they have a new release AND when they have an amazing deal on a book. Hundreds of thousands of people are about to descend on my little hamlet for what the locals call “Blueberry Weekend.” The scents of deep fried everything, the hard thumping sounds of carnival rides, and the ripe frenzy of craft fever will fill the air. Basically an introvert’s nightmare. So why don’t I just lock the doors and pull the shades until Tuesday? Two words: elephant ears. Nevertheless, I’m wishing each of you a happy (and delicious) Labor Day Weekend! It’s never fun for authors to ask for reviews but it’s part of the process. The truth is, reviews give us opportunities to share more books with readers in the future. The page proofs are off! I finished the final read-through of TEN KISSES TO SCANDAL and sent the galleys to my editor. This is so exciting! To celebrate, I’m sharing another snippet of Nicholas and Briar’s story (because it’s so hard for me to wait until December). The sinful timbre of his voice tumbled through her, stealing her breath. Her curiosity reached an anxious simmer, brewing hot and frantic beneath her skin. I hope you are having a wonderful summer. Can you believe that July is nearly over? This year has been a wonderful whirlwind in the Lorret household, but before too much time passes I want to take a moment to thank each of you. 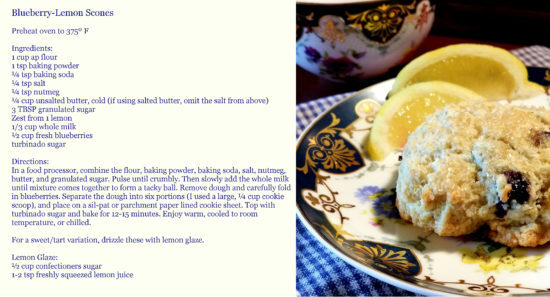 So to express my appreciation, I’m sharing a special summertime recipe with you for Blueberry-Lemon Scones. Enjoy! 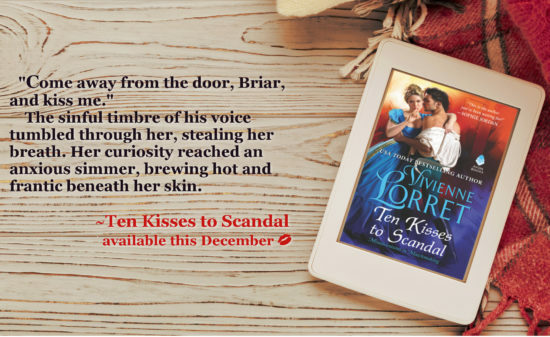 TEN KISSES TO SCANDAL sneak peek! 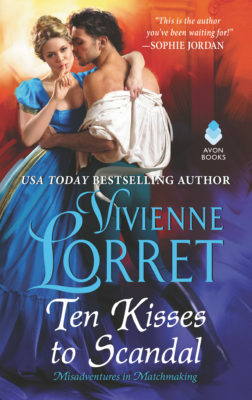 My copyedits for TEN KISSES TO SCANDAL have arrived and to celebrate, I’m sharing the first sneak peek! I’m so excited to be diving back into Briar and Nicholas’s story that I can’t stop smiling (and checking the calendar for the release date). Is it December yet? Briar Bourne’s matchmaking career could be summed up in two words—comic disaster. Unless she can learn about the irresistible forces that draw men and women together, her professional future looks rather bleak. But Briar has an intriguing plan—enlisting London’s most irredeemable rake to teach her everything he knows about attraction. Nicholas has no romantic notions about love, and no intention of changing his ways. He’s only helping Briar so that she can find the perfect bride for his jilted cousin. Yet Briar is so clever, so curious, so candid—so blasted tempting—that soon, Nicholas can’t stop wondering what it might be like if he was irresistible to her. “I wouldn’t mind, love,” Nicholas crooned, patting the tops of his thighs and earning a perturbed glare. Even so, Briar was too intent on her goal and stood, settling her cool, delicate hands to his face. The simple touch of her fingertips, soft and uncertain, stirred a low flame of arousal. He complied, half humoring her and half curious to see if she would balk and shy away. Yet she lingered, her warm, clean fragrance filling his nostrils and making him think of fresh bed linens, sun-kissed and wind-beaten into a decadent suppleness. He wanted to lie down with that scent, tumble with it, bury himself inside of it. And all this was before he felt the sweet rush of her breath over his lips. 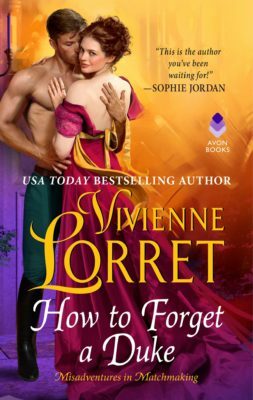 HOW TO FORGET A DUKE is on sale now! HOW TO FORGET A DUKE is here!!! It’s finally here!!! I’m hearing a chorus of angels singing Etta James’s “At Last” (which also happens to be my ringtone). 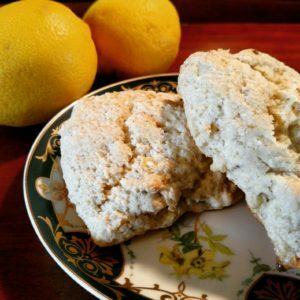 The recipe for these yummy Lemon Anise Scones will go out to all my newsletter subscribers on May 27th.